This is a blog post about everything, but mainly about everything in relation to God. I found a striking example of how the Christian confession of the distinction between the creator and the creature can be preached and applied. 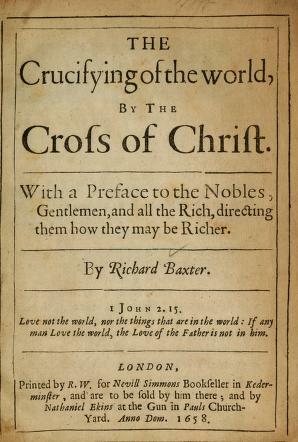 It’s Richard Baxter’s The Crucifying of the World by the Cross of Christ (1658), which began as an assize sermon (preached to judges) on the text of Galatians 6:14. By the time of publication, Baxter had greatly expanded it, so there’s no saying how much of it he actually spoke to the judges. But it has had an afterlife as a devotional or practical text, even though the section I’m about to share may sound more like metaphysics. This is why it would be a fundamental error to consider the world in itself, “without its due relations to God.” God can be considered without the world, but the world cannot be considered without God. It’s not a reversible relationship: when we compare these two Beings, one of them is absolute and necessary, while the other is contingent and dependent. In fact, the word “being” belongs properly only to the first, and is extended derivatively to the second. If you try to make the relationship reversible, ascribing independence to the world, you are treating the world as if it is the superior term. That is, “to look on the creature as a separated or simple Being or Good, is to look upon it as God.” The reason is just that there is only one “independant or separated Good,” and that’s God. Every other good is dependent and connected to that first Good. And here came in the first Idolatry of the world. When Adam had all his felicity in God, and had the creature only as a stream and means, and when all his affections should have been centred in God, and he should not have viewed one line in the volume of nature, without the joint observance of the Center where it was terminated; Contrarily he withdraws his eye from God, and fixeth it on the creature as a separated Good; and desiring to know Good in this separated sense, he made it an Evil to him, and knew it to his sorrow: And so forsaking the true and All-sufficient Good, he turned to a Good which indeed as conceived of by him was no Good, and knew it by a knowledge, which as to the Truth of it was not Knowing, but Erring. This re-telling of Genesis 3 as the story of Adam turning from God to idolatry, which is the same thing as turning toward the creature for its own sake, can be found also in Athanasius’ Against the Heathen/On the Incarnation. you must carefully note, that the dependance of the creature on God, is not to be fully manifest by the dependance of any creature upon another. The line is locally distant from the Center; and the streams are locally distant from the spring, though they are contiguous, and have the dependancy of an effect: But God is not locall, and so not locally distant from us. You have here the very difference between a Carnal and a Spiritual life. The Carnal man doth see only the carkaise of the world, and is blind to God, and seeth not him, when he seeth that which is animated by him. But the Spiritual man seeth God in and by the creature, and the creature is nothing to him but in God. It was never the mind of God to make the great body of this world to stand as a separated thing, or to be an Idol. He made all this for himself: The whole Creation is one entire volume, and the sense of every line is God. His name is legible on every creature; and he that seeth not God in all, understandeth not the sense of the Creation. As it is Eternal Life to know God, so this God is the Life of the creature which we know, and the knowing of him in it is the Life of all our knowledge. The illiterate world doth gaze upon the creatures, and fall in love with the out-side and materials, and play with it, but understandeth not a creature. By separating it in their apprehensions from God, the sense, they do annihilate the world to themselves, as to its principall use and signification. Baxter stands in the long Christian tradition which was perhaps best expressed in the high middle ages by Bonaventure, who traced the footprints of God, or vestiges of the creator, in all created things. To do otherwise is, in the terms of Ephesians 2:12, to be “without God in the world,” or to be a practical atheist. They see and know somewhat of the world, but God they neither see not know: They con∣verse with the world, but not with God: All their affections are let out upon the world, but God hath none of them: All their business is about the world, but they live as if they had no∣thing to do with God. Men do but seem to live, that live only on and to the creature; they do but seem to be Rich, that have no other Riches; and seem to have Pleasure, that have no higher Pleasures; and seem to be Honourable, that have but the Honour that comes from man. A great stir they make in the world, to little purpose.